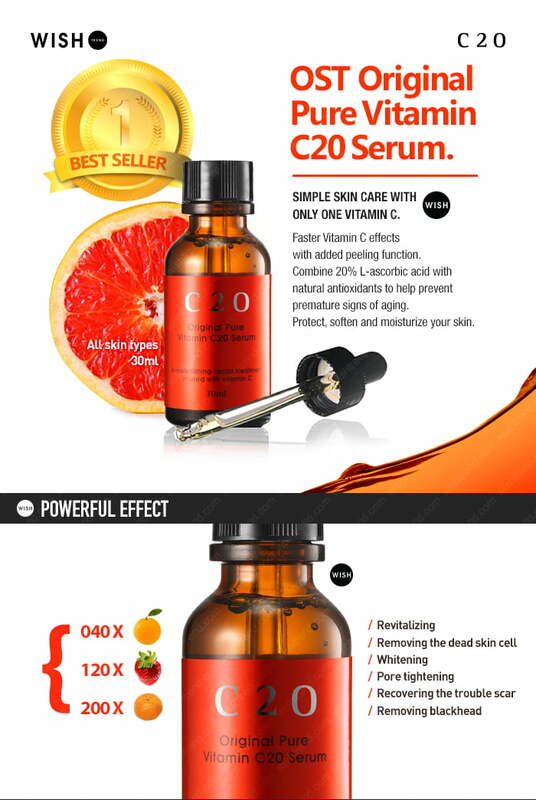 C2O OST Original Pure Vitamin C20 Serum is the best selling item of 2012 – 2013 on Wishtrend because it has proven to give a remarkable, and healthy skin. It contains pure Vitamin C that has the fastest effect to aid in skin whitening, fade acne scars/post-inflammatory hyper-pigmentation (PIH) and blackheads removal. It has been considered as an overall skin Vitamin C provides multiple benefits to the skin that not only give instant results, but also long term results and skin improvement. While some people see changes as soon as 2-4 weeks, it may take others 6-8 weeks to see a difference. After around 6 months, you’ll reach the maximum benefits. You can see instant result within overnight. You will feel your skin is hydrated, and see more luminosity and glowing skin in the morning. Your skin will show a significant improvement with constant application of this Vitamin C serum as fine lines and wrinkles fade away. 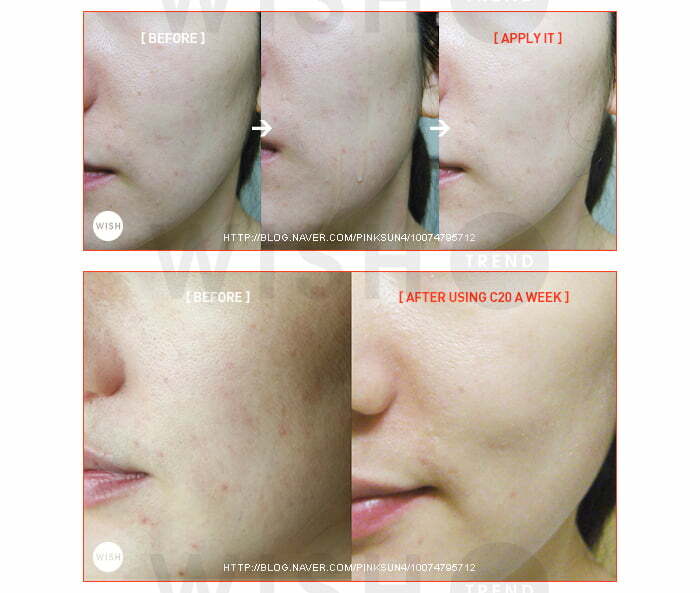 It has been proven to deliver the desired result as more than 91% users are satisfied with this serum. The high content of Vitamin C is safe for all skin types especially those who experience sensitive skin. One should noted that when exposed to air, Vitamin C solution undergoes oxidation and becomes not only ineffective but also potentially harmful. However, the C20 Vitamin C serum is freshly produced on monthly basis in order to ensure that quality is maintained. Last but not least, the price is affordable for you to enjoy a bottle of 100% pure Vitamin C for a remarkable, and healthy skin that you’re looking for! It produces Collagen, a protein that gives your skin its elasticity. Collagen is very important as you age, collagen breaks down and wrinkles begin to form. Vitamin C helps to stabilize your skin’s levels to counteract wrinkle formation by increasing the production of collagen. Vitamin C is a powerful anti-oxidant that reduce the visibility of age spots due to sun damage. It also functions as reverse age-related damage to skin. Vitamin C protects against and repair UV damage like discolouration and fine lines. After cleansing and toning, apply 2-3 drops gently all over face everyday night as Serum. Recommended to be used at night. Applying sunblock is required during daytime. Slight stimulus may be experienced at the first time to use Vitamin C 20 Serum. Mixing with several drops of serum and toner makes your skin refresh without sticky feeling. Apply lotion and cream as your daily skincare routine after every application of serum. Sediment might occur in the bottle neck and the bottom but it is safe to use. Browning liquid is natural phenomenon of highly concentrated pure Vitamin C.
Do not to leave the lids off for any longer than necessary when applying. Keep it in air-tight to block out UVA and UVB light.